We recently went through a refi and were immensely pleased with EZ Mortgages. They are very thorough, very patient and extremely detailed in what they do. They will answer 100 emails if you want and present an objective assessment. With rates currently near an 11-month low is this an inflection point of a possible break back to prior lows, or a head fake by the Mortgage Backed Security and Treasury markets? Of course, I don’t know, but my best guess is it’s a head fake. Just like each rise in rates from roughly 1985, or so, to 2013 proved temporary, within the larger trend of ever falling rates, I think the dip we’re experiencing now is temporary, within what I expect to be a slow, steady climb to higher rates that may again last decades. With this morning’s employment report meeting expectations of 215,000 (217,000 officially) people added to payrolls in May, the US has “regained” all the jobs lost during the Great Recession. Furthermore, although the numbers of people getting back to work is fairly low compared to prior recoveries, the Great Recession wasn’t any ordinary recession, so the bounce back can’t be expected to be the same. The bottom line is that people are getting back to work, albeit at a relatively slow and steady pace. Household and Non-profit net worth met its prior peak from 2007 at the end of last year, and exceeded it in the first quarter of 2014. (Data from the St. Louis Fed). Household debt service as a percent of disposable income is at its lowest level since 1980. (Data from the St. Louis Fed). Real personal consumption expenditures on durable goods (furnishings and durable household equipment) are at an all-time high (Data from the St. Louis Fed). Of course, in most cases data points can be selected to frame a picture one would like to see, but to me, the trend is clear. The economic backdrop continues to improve, and barring any unforeseen shocks, should continue on that trend. That, most likely, means rates will continue a steady slog higher – albeit with dips and opportunities along the way. And, supporting that belief, is the Fed’s continued, measured, slowing of their unprecedented monetary stimulus (although, they’ve been wrong plenty of times before, too). So, what type of shift or shock could drive rates back below current levels, closer to their historic floor? Perhaps bad news out of the European Union. They still have plenty of issues percolating just under the surface, but for now at least, they seem to be headed in the right direction. Maybe a renewed conflagration in the Ukraine? Sure. But again, it appears that situation may unwind itself relatively calmly. After all, that’s what’s best for all involved, one would think. China? A lot of people worry about what’s going on there – with good reason – since their economic data is a little suspect, at best, and they’re clearly facing some deleveraging issues and other economic hurdles, as well. Not to mention that they’re a massive player in the global economy. But again, so far, no meltdown appears too near on the horizon. What if inflation in the US picks up faster than currently anticipated? Would the Fed then raise the Fed Funds rate faster than anyone expects, throwing cold water on the warming economic recovery? Then there’s the end of the Fed’s monetary stimulus and potential for raising the Fed Funds Rate. What will happen is anyone’s guess. So far, their measured reduction of Treasury and Mortgage Backed Security purchases has been handled by the markets much more smoothly than the announcement of its coming by then Fed Chair Bernanke a year ago. 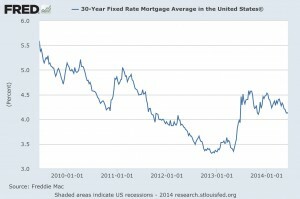 In fact, after rising in the latter half of 2013, rates have done nothing but slip a little since 2014 began. I guess, if the slow and steady economic expansion is in fact completely driven by the Fed’s monetary stimulus, there’s a chance that we’ll take a step or two back as we roll through this year. If consumers retrench and corporate earnings sag, that could precipitate a shift in the markets where bonds and mortgage backed securities may rally from a relative “flight to safety” but? I just don’t see it happening that way. My best guess is that we’ll continue a slow and steady recovery, that may last longer than anyone anticipates, providing opportunities for economic advancement, without seeing things heat up so much that the Fed will have to do more than pump the brakes periodically (talking about “when” they may start raising the Fed Funds Rate, for example) to temper expectations of an overheating economic engine that would require more sudden action, at the expense of said recovery. As always, time will tell. I’m still working on my better crystal ball, to help me predict the future with more accuracy. So far, I’m not making much progress. I’m open to suggestions anyone may have though. In the meantime, here are your rates for this week. Please don’t hesitate to call or email if you, your friends, or family have questions about buying or refinancing residential or commercial real estate.